Lou is an observant outsider. She isn’t fitting in at home or at school. 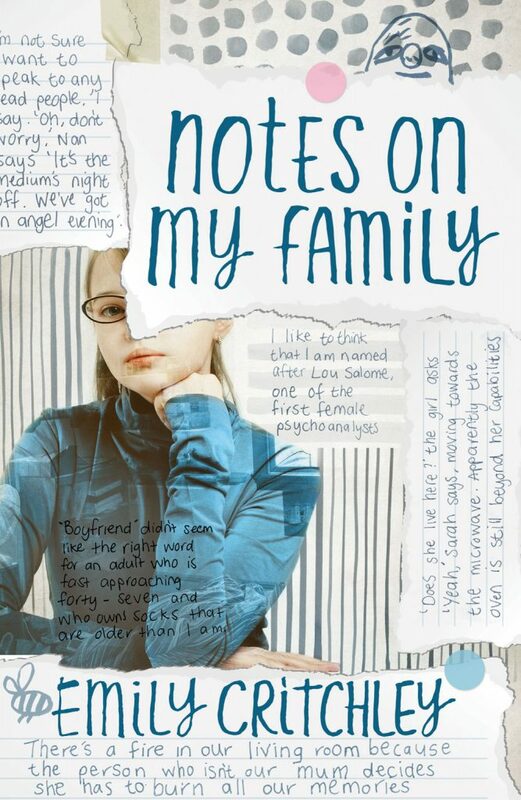 Her family life becomes increasingly hectic after her dad announces he’s having an affair and Lou learns her parents will soon be divorcing. Lou’s mum isn’t coping well. Her brother, Mikey, deals with the crisis by baking cakes; her older sister Sarah is dating a fireman. Lou is less than impressed when she is told by her form tutor that she must be a ‘buddy’ to the new girl, Faith, but the two girls form an unlikely, but meaningful, friendship amidst the chaos of their ordinary lives. It’s 7.00pm and we’re sitting around the dinner table. There’s me, my brother, my sister and my mum and dad. I’m the youngest. My dad likes us to eat together in the evenings so we can ‘catch up’, and ‘talk about our days’. We’re eating chicken Kievs with new potatoes, carrots and peas. I have extra carrots as it’s a Tuesday and Tuesdays are a good day for orange foods. I don’t have any potatoes as I don’t eat starch and protein together. The chicken Kievs are pre-made. Mum doesn’t cook much. To her, this is cooking. There’s five of us and, because you have to buy the chicken Kievs in twos, there’s one left over. It sits on a plate in the middle of the table. We’re already eyeing it up. Probably my mum will offer it to my dad who will either give it to my sister because she’s his favourite, or he’ll suggest my brother and sister split it because my brother’s a little skinny, and he needs the sustenance. Either way, it’s unlikely I’ll get it. I’m the smallest and the youngest, and a girl, so it’s assumed I don’t need a second chicken Kiev, or even a half, even though I don’t have any potatoes. We’re eating in the kitchen. It used to be the garden until my parents had the extension built two years ago. Before that we had a smaller kitchen and ate at a dining table at the back of the living room. Now we have a big kitchen, all fake oak cabinets painted green, with a large square table in the middle. There’s a new television that hangs on the wall in the corner by the kitchen doors that open out into the garden that’s now slightly smaller because the kitchen’s bigger. I waited ten years for this kitchen, my mum always says when anyone comes to the house for the first time. We’ve lived in the house for thirteen and a half years, exactly the same amount of time that I’ve been alive. We moved when Mikey was two, so he doesn’t remember the old house but Sarah does. We call Michael Mikey. Dad still calls him Michael, or Mike, because he thinks it’s more masculine. He’s never said this but I know that’s why. Mum was the one who first called him Mikey. Most of the time now Dad forgets and calls him Mikey too. My mum had my brother and sister close together. She was very happy to have a girl and a boy. It’s what she’d always wanted. Only then I came along. I was ‘a happy accident’, which is what Mum said when I asked her why they decided to have me as well. Dad isn’t eating much, which is unusual. My dad’s a P.E. teacher and, like Mikey, he also needs sustenance. He works at our school which is unfortunate, although he tries not to embarrass us. It’s mostly Sarah who gets embarrassed. She looks the other way if she ever sees him in the corridor. Sarah doesn’t have to do P.E. anymore because she’s in the sixth form. Mikey doesn’t have to do that much P.E. because he’s doing his GCSEs and he doesn’t like sport. In fact, none of us like sport very much which is a shame for Dad. Dad clears his throat and puts his knife and fork down. ‘There’s something I’ve got to tell you all,’ he says. This is it, I think. They’re getting divorced. Sarah and Mikey stop eating. I know they are both thinking this too. The reason we are all thinking this is because Dad has been sleeping on the sofa for the last three weeks. At first when we found him there he’d tried to come up with excuses. I was snoring. Your mother couldn’t sleep, or I wanted to stay up and watch television. After a few days of this he gave up with the excuses and we got used to seeing the spare single duvet folded up neatly on the sofa arm in the mornings. It had one of Mikey’s old duvet covers on it. The one with the frogs. A joy to read: as funny as it is perceptive. Its combination of razor-sharp observation, dry humour and warm humanity is a rare one; the fact that this literary accomplishment is a debut makes it a rarer achievement still. Emily Critchley possesses a masterly style. There’s something in this novel for everyone. An observant and intelligent writer, Critchley is a talent to watch.